• A new display exploring the demand for copies and remakes of portraits originally created by Tudor court painter Hans Holbein the Younger has opened at the National Portrait Gallery. Hans Holbein Re-made features a selection of copies of Holbein’s works from the gallery’s collection including portraits of William Warham, John Fisher, Sir Thomas More and Sir Richard Southwell, all of which have undergone new technical analysis as part of the gallery’s Making Art in Tudor Britain project. The research reveals new details about how and when the paintings were made and the techniques used. The display also includes a portrait of Thomas Cromwell, Earl of Essex – thought to be one of the first miniatures Holbein painted alongside a digital screen which enables this work of Holbein’s to be compared with that of another artist working in his studio. In Room 3. Runs until 31st August. Admission is free. For more, see www.npg.org.uk. 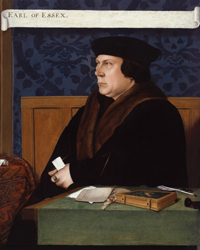 PICTURE: Thomas Cromwell, Earl of Essex, after Hans Holbein the Younger, early 17th century (1533-1534). © National Portrait Gallery, London. • A new display of revolutionary sixteenth century woodcuts opens at the Royal Academy of Arts on Saturday. Renaissance Impressions: Chiaroscuro woodcuts from the Collections of Georg Baselitz and the Albertina, Vienna, looks at the development of the printing technique of the chiaroscuro woodcut and presents more than 100 rare prints by artists from Germany, Italy and The Netherlands which have come from the collection of the Albertina Museum in Vienna and the personal collection of Honorary Royal Academician Georg Baselitz. The new technique – the first known example of which is widely believed to have been created by Hans Burgkmair the Elder with his 1508 depiction of Emperor Maximilian on Horseback – involved supplementing the key ‘black line block’ with one or several ‘tone blocks’ with chiaroscuro woodcuts the first colour woodcuts to make dramatic use of light and shadow to suggest form, volume and depth. Runs until 8th June in the Sackler Wing of Galleries. Admission charge applies. For more, see www.royalacademy.org.uk.